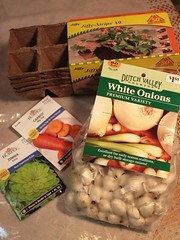 Once I got it, I passed by an large discount store to get some q-tips… I noticed that the garden department was still open and I saw tons of seeds and bulbs and they already had Tomato seedlings for sale… but I didn’t get some ‘cuz it’s still too cold in the mornings. This entry was posted in Uncategorized and tagged car, garden, purchase. Bookmark the permalink.